_We do everything possible to ensure that your puppy arrives happy and healthy. We start by breeding only dogs that have undergone and done well on all relevant health tests. We follow-up with a comprehensive health care regiment for our puppies that includes examination, deworming, vaccinations, early spay/neuter, and microchip implant. We are proud of our high standards in health testing and we will gladly show you our parent dogs' health records and respond to any questions that you may have. We also guarantee that each of our breeding dogs is a treasured family member who has the opportunity to live life to the fullest. We are not a kennel. Your puppy is born and raised in a family environment and has been exposed to a wide range of experiences. He or she will arrive well socialized and eager to become a member of your family. 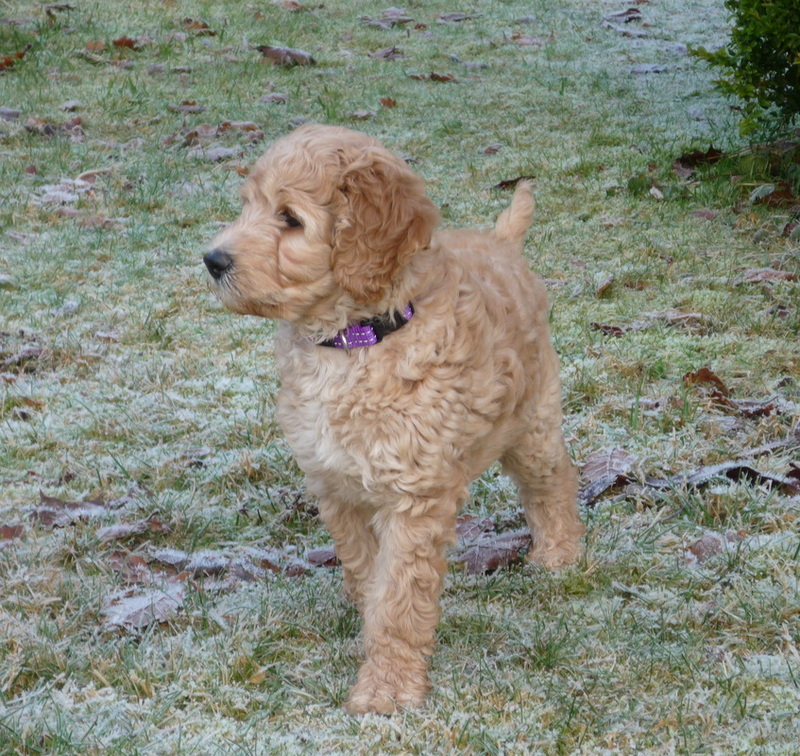 We are confident that your puppy will arrive in excellent health and with the wonderful temperament that Multigenerational Australian Labradoodles are known for. Your puppy comes with a 3 year warranty against any genetic health condition that affects the quality of life of your dog. We care deeply about our dogs and take our responsibility as breeders seriously. We welcome questions from our Leapfrog adoptive families throughout the lifetime of your dog. If at ANYTIME during its lifetime your Leapfrog Labradoodle needs a new home, we will gladly take it back. We stand behind our dogs 100% and we will always be here for our dogs and their families. 1. The Breeder guarantees that the puppy is in good health at the time of delivery. The Buyer agrees to have the puppy examined by a certified veterinarian of their choice within 3 days of receiving the puppy. If the puppy is found to be in poor health or the veterinarian discovers any pre-existing conditions, the Buyer has the option of returning the puppy to the Breeder for a full refund or of keeping the puppy. If the decision is to keep the puppy the Breeder will reimburse all veterinary costs up to the full purchase price of the puppy that are related to this pre-existing condition. 2. The Breeder provides a warranty for 3 years after your puppy's date of birth against any genetic health defects that would negatively affect the dog’s quality of life. This warranty is conditional upon the Buyer meeting all the requirements under Buyer’s Responsibilities below. Should such a condition arise, the Breeder will choose either to offer a refund of the original purchase price or offer a replacement puppy from the next available litter. In this situation, all veterinary records must be supplied to the Breeder and the puppy does not need to be returned to us. In the case of hip dysplasia, the Buyer must provide documentation from OFA or PennHIP and in the case of cataracts or PRA in the first three years the Buyer must provide records from a Veterinary Ophthalmologist. 3. The Breeder reserves the right to have the dog checked by a veterinarian of the Breeder’s choice, at our expense, before offering a replacement puppy or refund. 1. Buyer agrees to provide the puppy with a safe and loving home. 2. Buyer agrees to feed the puppy only a premium quality dog food. Dog food purchased at the grocery store does not constitute a premium diet. 3. Buyer agrees to take the puppy for an annual veterinary check up and to follow all preventative treatment recommended by the veterinarian. 4. Buyer will not allow the puppy to become overweight or engage in rigorous exercise during its first year of life. 5. Buyer agrees to take the puppy to at least one obedience class by the time the puppy is 4 months of age. 6. Buyer agrees to contact Leapfrog Labradoodles if at any time during the dog's life s/he is unable to care for the dog. We have read and agree to the above terms and conditions. They apply only to the original owner and are not transferable. The health warranty is null and void if all of the above conditions have not been met.